Here’s a clip featuring jazz pianist and rhythm & blues stylist, singer, and songwriter Mose Allison, with a song he wrote and recorded in 1963 . It’s “Young Man’s Blues” a lament for the titular young man who once ‘had all the money’. Luckily, thanks to a 1970 cover version by the Who on their Live At Leeds album, pretty soon Mose Allison had all the money, too. 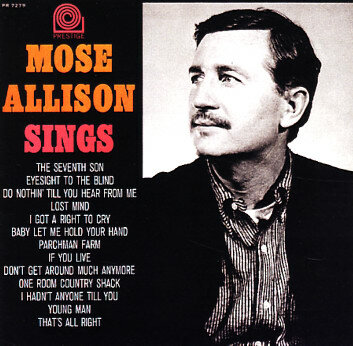 The song is taken from Allison’s Mose Allison Sings album. During a time when having a cross-over career from the jazz world to the world of R&B was looked upon as commercial suicide, Mose Allison was a fearless artist who’s music defied the high walls between genres and audiences. He was born in the Mississippi Delta in 1927 and took to the musician’s life at a young age. By the 1950s, his skills as a pianist were being employed while in jazz bands with Stan Getz, Al Cohn, Zoot Sims, and Gerry Mulligan. But Allison’s feel for the blues allowed him to gain the attention of R&B fans too, including many rock players, from Van Morrison, and later to the Clash, and Elvis Costello. As mentioned this particular tune, a jazz-inflected number that features Allison’s laid back tenor drawl and light-as-air piano lines, was ripe to be transformed into the monster rock assault by the Who, who made it a part of their live set, and later recorded it for their monumental Live At Leeds album. When he got the royalty cheque, he was convinced it must be mistake. This perhaps shows that anything held together by the base ingredient of the blues can be interpreted and re-interpreted in any other musical milieu that has that same base ingredient. Yet, it also proves the song’s writer to be ahead of his time, in being able to see that common thread and build it into his music, despite the difficulties of being able to successfully do so in the early 60s. While the decades rolled on from the 50s to the 90s, Allison continued to be an active recording artist and performer, with a dedication to putting out records that was perhaps contrary to his lack of widespread recognition among pop music fans. At the age of 82, he’s released a new record this year, Way of the World produced by Joe Henry on Anti-Records. In this 21st Century when mixing styles and writing songs which are open to stylistic interpretation is common, Mose Allison has in many ways come home. For more information about Mose Allison, check out moseallison.com. You can review or preview the music on the Mose Allison on MySpace.